Activated Charcoal – The New EDM Trend? Everyone knows dancing and drinking go together near perfectly, and depending on how crazy you’re dancing, you’re going to need something to drink throughout. This once cheerful yellow summer drink is turned dark and mysterious by small dissolvable charcoal tablets. Add this brooding twist on a delicious favorite as an accessory to complement your Industry AF outfit. Yes, activated charcoal is part of a drink recipe people are making and willingly drinking. Seriously, why wasn’t this a thing back in the nineties? Or even the early aughts where people would regularly ingest poisonous stuff and Poison Control would have us pouring it down their gullets?? Why didn’t Poison Control tell us we could make it into lemonade??? While it has been a thing over the last few years in health food stores for it’s “detoxing” properties, this is the first time I’m seeing it promoted by a festival-centric entity. From what I could tell the kind we carry on the ambulances (those of us that still do) is much more potent than the kind they are selling over the counter. There’s a real irony here considering this is an EDM trend and that culture is best known in medical circles for it’s killer bass drops playing second fiddle to the ecstasy, Molly, and whatever other synthetic of the day is. The fact they are promoting something that may be able to counter those synthetics as ‘industry’ really just gives me the giggles. The one thing they fail to mention in the original article, but thankfully they do on the Instructables Page where the recipe originates, is that it is necessary to check dosages of the activated charcoal as well as any medications you are currently taking. Just as it can absorb some of the synthetics, it may also be enough to absorb some of your medically necessary medication. 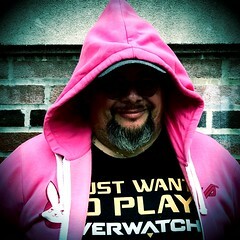 With Techno Lemonade hitting the scene, we can only hope that this may result in some self-medication of an antidote for other poisons in their system… all in the name of being fashionable. In many 911 systems, the majority of call types are medical. Trauma calls are just a small portion of the call volume. If you have ever worked at a mass gathering sporting event or music festival, you know you are much more likely to treat aches and minor wounds than major trauma. You are also much more likely to distribute over-the-counter pain relievers, Band-Aids and ice packs than you are to use a fistful of tourniquets. The same is true during the course of our everyday, even our off-duty days. Most self-care is for minor injuries and most requests from friends and family for first aid are for strains, sprains, bruises, cuts and scrapes. Chase Jarvis, a professional photographer and iPhone photography expert, wrote “The Best Camera Is the One That’s With You.” I agree and this point of view happens to apply both to photography and first aid kits. The best personal first aid kit is the one with you. You can read the entire article at EMS1.com. If you want a deeper philosophical read on this year’s EMS Week theme, then I highly recommend you reading Scott Kier‘s article “Always In Service“. He basically lifted the words right out of my own mind and is pretty close to what I would have said if I had the time to be deeply philosophical for EMS Week. This is reminiscent of Oklahoma Trooper Martin who choked Paramedic Maurice White back in 2009. That actual video can still be seen on Youtube. I blogged quite a bit about this incident when it happened, the outcome was that Trooper Martin was suspended for five days, around six months later he was under investigation again for use of force during a different arrest, and five years later under investigation AGAIN for other misconduct. 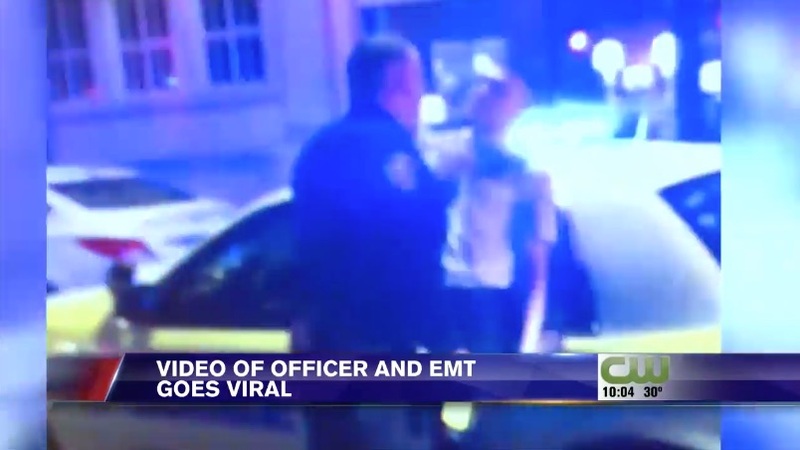 Although these are two different cases, with all the occurrences of assault on EMS personnel, this kind of video portraying the assaulter as a law enforcement officer is especially disturbing. Generally our support is offered to the law enforcement community because we have a deeper understanding of what their days are like and the challenges they face than the public. Incidents like this could generate a rift between the services that will lead to escalating conflict, similar to the issues we hear about between law enforcement and firefighters on the fire ground. I believe mutual respect is a reasonable expectation in situations like this, and I can only hope that the Portsmouth Police Chief will deal with the matter in a fashion that acknowledges that respect more fittingly than the Oklahoma Troopers did, who were really by the later accounts just protecting a bad apple. 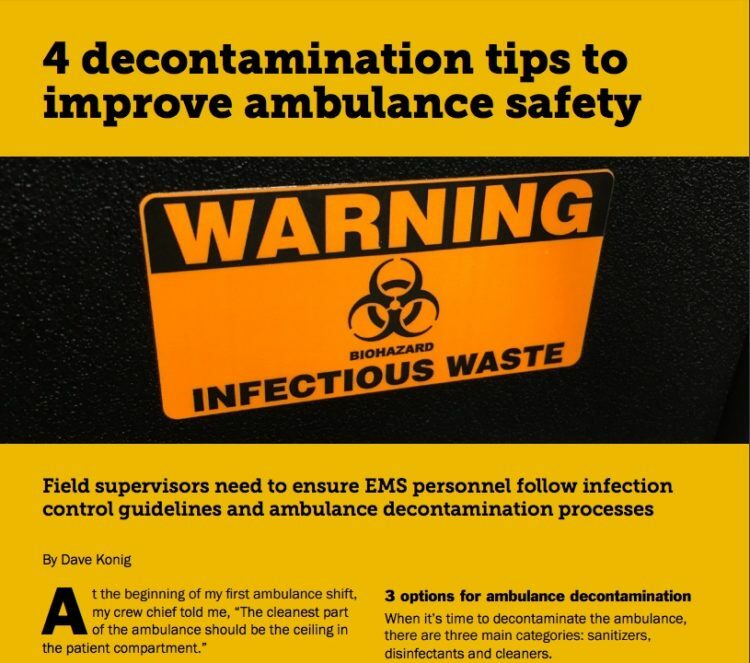 I have a new article titled 4 decontamination tips to improve ambulance safety in the Winter Edition of Paramedic Chief. It is highly recommended reading especially as we come into a new year where we should give the same focus and attention we give to clinical excellence to the safety and well being of our providers. You can download the PDF or view it as a digital magazine.